Lindsey King ’15 has loved being a barista for the past 15 years. Serving others, creating delicious concoctions that make connoisseurs smile, connecting with strangers over a shared passion, and then those strangers becoming friends – all of those experiences have brought her joy. As King finished her degree in organizational management through Malone’s management program – while creating drinks such as a vanilla balsamic latte – she began to dream of a business plan for a different kind of coffee shop. One to where she could open her front door and walk. One that had a meaningful purpose. One that could transform a neighborhood. She and her husband John ’11 are working hard at making their dream come true just 10 blocks south of Malone’s campus. They’re renting via neighborhood investment a building located near Schreiber Elementary and Kempthorn Automall that used to be a pizza shop, then a service station. They’re calling it “Walkie Talkie.” Renovations should be completed in June, and they’re hoping to open in July. Her plan includes a simple menu and to serve pastries and beverages of high quality, such as local milk from Hartzler Dairy and Heart coffee from Portland, Oregon. Armed with her management background, Lindsey also plans to get a B Corporation certification. According to the website (www.bcorporation.net) B Corp is to business what Fair Trade is to coffee or the USDA Organic certification is to milk. B Corps are for-profit companies certified by the nonprofit B Lab to meet rigorous standards of social and environmental performance, accountability, and transparency. At last year’s Convocation, Malone president David King challenged students to “turn left” when they came to the stoplight at 25th and Cleveland Avenue. 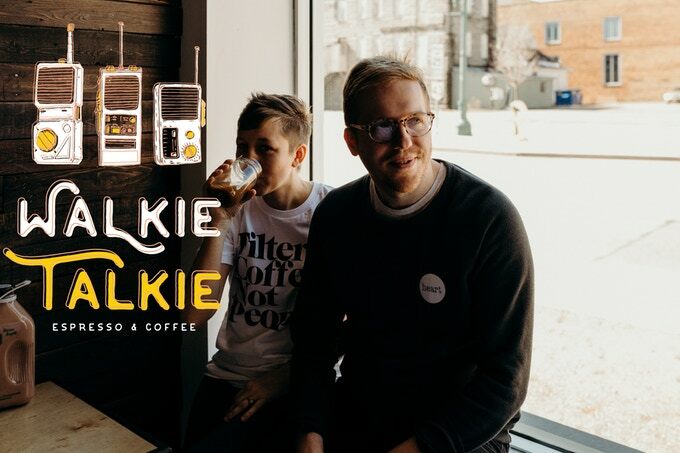 King said he’s excited to drink coffee at Walkie Talkie. View more information about the Walkie Talkie Coffee Shop.